Blogging is the new way to express yourself, share your opinion or get your voice heard by many. It's also a great way to generate income by doing what you like - writing. Nowadays, everyone can start a blog, as long as they have something interesting to write about. But is it hard to start a blog? Many people have no idea where to start and sometimes wrongfully think that it requires coding skills or deep understanding of the website building process. But it doesn't. 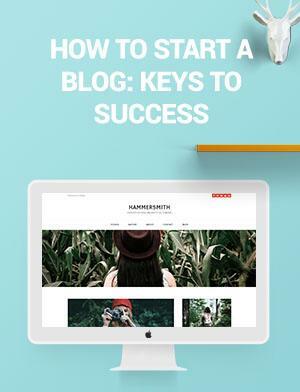 We'll show you how easy it is to create a stunning blog and start writing your first articles in no time. So let's begin. The niche is the main subject around which you will focus your blog. If you're going to talk mainly about fashion then that's your niche. Write about something that you have strong knowledge and opinion about. Writing with love and passion is the most important thing about starting a blog. Your readers will feel the vibe from your articles and share it with the world, that's what you want. If your niche is very competitive, you should make an assessment if there's a real value and how to generate traffic in this competitive area. You can start with something less competitive, build your audience from there and gradually spread to other topics and interests of yours. There are many places to start your blog but we are going to talk about Simvoly. It's the perfect place for anyone without coding skills or any experience to make a blog, website or even an online store. Simvoly have amazing templates that are fully customizable and optimized for search engines, which will help you to generate traffic. You can control everything, get a free domain and customize the site yourself with the simple drag & drop builder. Start by going to Simvoly and pick a theme. Remember, they are just a starting point and you can modify anything super easy. 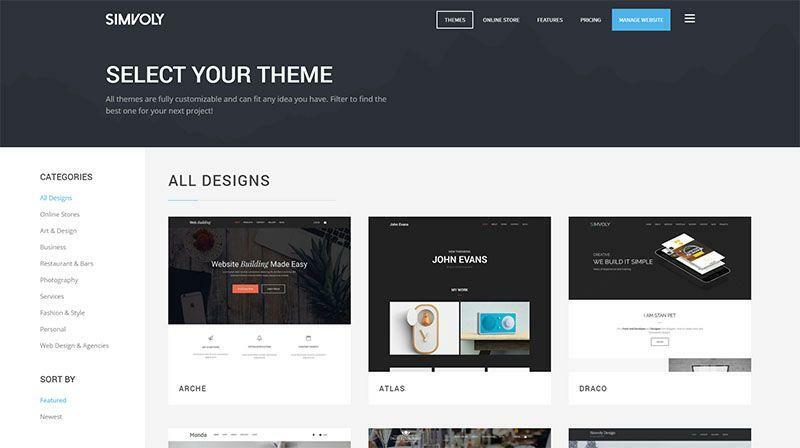 Once you select a theme, you will enter the website builder. It's very clean and easy to use. 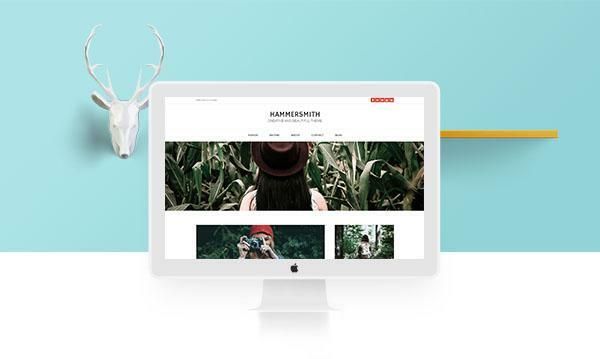 First you will see your homepage; you can start adding your logo, content, images, etc. If you don't have a logo, as many of you might not have, you can just write your name in some awesome font and that will do the trick for the moment. Customization is super easy - you can add widgets from the '+' icon on the left or whole block sections from the '+' under each container. Containers are the building blocks and they are filled with widgets. The great thing is that everything is organized in columns and it's really easy to adjust. To go to your blog posts, you can simply click on 'Blog' in the menu or from the Pages button on the left. You will be directed to the Blog Section where all your posts are listed. 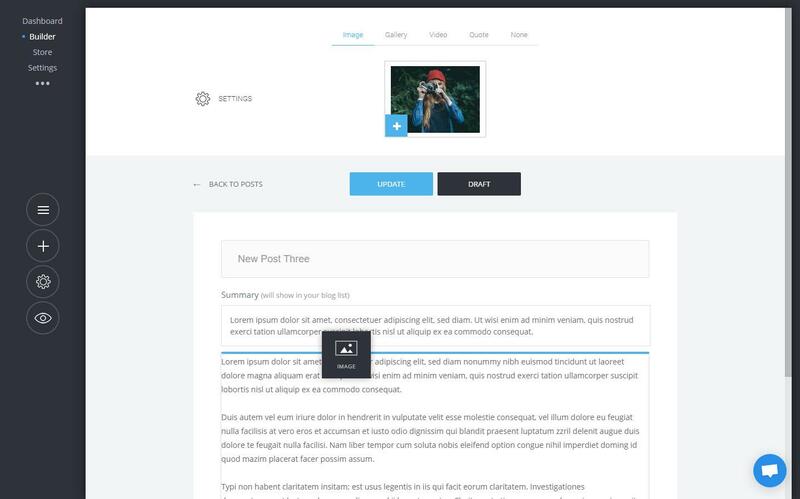 By default, you will have a couple of sample posts that you can edit. Ok, you've clicked on 'Add Post' or edited already existing article, it's time to start your first post. Begin with the post title. It needs to be something catchy, not too long and summarizing the post subject. For example: "How To Start A Blog: Everything You Need To Know", that's the title of this post, made with Simvoly. After that, it's the summary that is going to show on your blog list. You don't have to worry about that for now. Writing the content of your article is next. You start with one text widget where you can start writing. You can adjust the font, size, color, line height and so on. We suggest that you keep the font to at least 16px and with at least 1.8 line height. Your text will be nicely visible and with nice spacing between the lines. It's important that you keep it consistent throughout your whole article, otherwise, it will look unprofessional. If you want to insert an image, video or anything else, simply click on the '+' at the left and drag the desired widget. Drop it underneath any widget and edit it's content. Then you can drop another text widget and continue with your article. It is that simple. To avoid spelling errors, I recommend you to use spellchecking apps like Grammarly which help with typos, punctuation and spelling errors. Once you're done with the article, you can add a nice featured image, video, slider gallery or a quote, that will show as thumbnail on your post. Pick something that's engaging and represents what your article is about. You can access your post settings by clicking on the 'Settings' button, placed to the left of the featured image. From there you can choose to show a sidebar or a header on your article, enable comments and comment's approval, as well as social sharing buttons for your article. You can also add tags, categories, change the URL of the post, it's author, or view the comments. Everything is pretty simple and you don't have to hustle to find what you need. That's how easy it is to write your blog posts and make them look nice and professional. Don't forget - keep the styling consistent in all your articles and use nice and quality images. 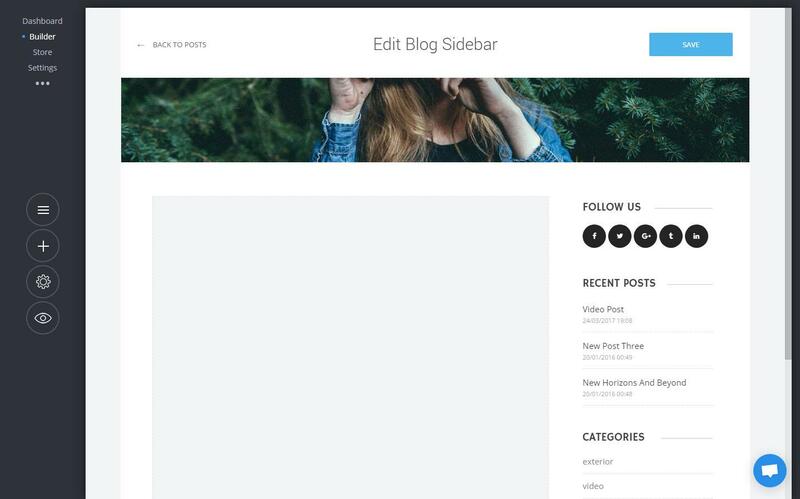 To edit the header and sidebar of your blog, simply click on the 'Edit Header & Sidebar" button on your list page. For the sidebar, we recommend you to include your recent posts, categories, tags, Instagram or Twitter feed and a subscription form. The subscription form is important for your blog because it will collect the emails of your visitors. This way you can email them about new posts and promotions and engage with your visitors. Now that you have a few articles written, you can highlight them in your homepage or anywhere on your website. You can do that with the Blog Widget. If you want to learn more on how to create professional websites you can check out our amazing beginners guide: How To Create A Professional Website In Under An Hour. Generating traffic is not easy but if you are motivated and write compelling articles, you won't have a problem. One of the most important things is that you don't get discouraged and stop. Keep posting at least twice a week about new and interesting topics. You might not have that many readers in the beginning, but they will grow with time. Sharing your articles in Facebook is very important. It's an easy way to get your content viewed and shared by your friends. You can try sharing on Facebook groups that have lots of followers and are appropriate for the content you write about. Twitter/Instagram - Tweet about your blog and use relevant hashtags to attract more visitors and retweets. Same stands for Instagram - post a nice image, relevant to your article and use trending hashtags. Other Networks - Pinterest, Google+, LinkedIn and others are also great for attracting visitors to your blog. Analytics - Simvoly has simple analytics where you can track your visitors, your most popular posts and where your traffic comes from. It's important to understand your most valuable sources of traffic and how to persuade other channels for new visitors. We recommend you to add Google Analytics tracking for more detailed overview of your visitors. You can do that by adding it's code in your website settings -> advanced. Making money by blogging can be done in a few ways but it's required to have a solid visitors base. If you have 10 visitors a day, you obviously can't expect to generate income out of it. Having a blog for your business can generate you traffic which you can turn into potential customers. By giving them a great a value by reading your posts will create a great connection between you and the user. You will be more likely to turn them into customers and to be referred. Keep it regular, be honest and objective and it will bring you a lot of dividends in the long run. You can place Google Adsense banners on key places on your website and get paid for each click you have on them. Or add banners from people who are interested in advertising on your website. Another way is via affiliate programs - for example If you talk about a certain product, you can link to it with a unique affiliate link. Once a person clicks on it, you will get a % out of anything he buys on that website for a period of time. That's a great way for income if your audience is interested in the advertised product. Sponsored posts is another great way of monetizing your blog. You can be reached by companies that want you to write a review or a post on the certain topic for a price. Go for it. In conclusion, starting a blog is easy... actually it's never been easier. With Simvoly you don't need to worry about programming, hosting or security. You can simply enjoy and be creative... be unique.